Bognor Regis Town boss Jack Pearce. Picture by Tim Hale. 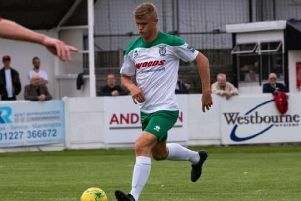 Bognor Regis Town boss Jack Pearce has revealed four defenders have turned down the club due to travel commitments. The Nyewood Lane-outfit have been on the hunt for replacements for centre-backs Keaton Wood and Corey Heath, who have been ruled out indefinitely, but the distance of the club has put players off joining. He said: “In the last couple of weeks we’ve agreed to take four different central defenders on but once we spoke to the player or their agent they’ve considered the distance of travelling to Bognor not to their liking. The Rocks battled back from 2-0 down to beat Bostik South East side Three Bridges 3-2 in the Sussex Senior Cup on Saturday. Pearce was naturally pleased to pick up the win but paid credit to Bridges. He said: “Unfortunately football is not the sort of game where you can say ‘we’re going to play well now’ and to be fair to Three Bridges they worked very hard in the first half. “They were the better side and could have been possibly more than 2-0 up. We had a couple of chances which we didn’t take but it’s always encouraging. 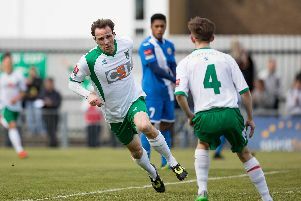 Bognor travel to 19th-placed Harlow Town on Saturday before hosting seventh-placed Enfield Town on Tuesday. Pompey-loanee Brad Letheridge will be available for Saturday, while fellow loan players Freddie Read and Leon Maloney are also being considered. Pearce has already set a points target for the two games but wants to see a marked improvement in their defending. He continued: “I’ve always said if you can win at home and draw away, at the end of the season you will be somewhere around the top of the league. “We hope to come back with at least a point, hopefully more but we can’t keep coming from behind. We have to improve our defending.